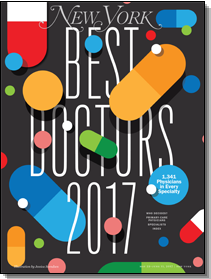 Dr Darius Kohan has been awarded the honors of being a 2017 New York Magazine Top Doctor as well as 2017 Castle Connolly Top Doctor in the New York Metro Area. These awards and all other past honors can be seen under the publications section on Dr Kohan’s Castle Connolly profile. 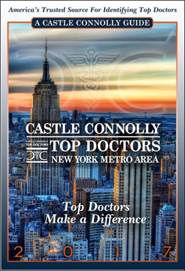 A New York City research and information company, Castle Connolly Medical Ltd., publishes an annual database, Top Doctors: New York Metro Area, which lists those whom Castle Connolly has determined to be in the top 10 percent of the region’s physicians — nearly 6,000 in all. For the past 19 years, Castle Connolly has been providing New York Magazine with a shorter version of this list for the magazine’s “Best Doctors” issue. Space prohibits New York Magazine from publishing the full list; this year, the doctors on our list number 1,341. Castle Connolly explains their online physician directory as, “Is searching for the best doctors in NYC harder than you thought it would be? Finish your search with Castle Connolly. Our searchable database of practicing doctors includes the New York City metro area and surrounding cities. Doctors do not pay to appear on our lists. Through peer nomination, research, review and screening, we have comprised an extensive listing of the best New York doctors. Included in your search results are helpful details on the doctor such as education, training and special expertise.” Since 2003 Dr Darius Kohan has been considered a peer reviewed Top Doctors in the Otolaryngology category. For the 5 year Dr. Kohan has been labeled as a New York Super Doctor. SuperDoctors explains the nomination and award process as “The selection process for Super Doctors is a rigorous multi-step process designed to identify physicians who have attained a high degree of peer recognition and professional achievement. Super Doctors is a selective yet diverse listing of outstanding doctors, representing consumer-oriented medical specialties. First, we create a pool of candidates. Each year Super Doctors invites physicians to nominate colleagues they know to be exceptional in their specified field. Physicians are asked to consider the following question: “If you needed medical care in one of the following specialties, which doctor would you choose?” Numerous safeguards are in place to prevent ballot manipulation and doctors may not self-nominate.